The Linville Gorge, located on the Grandfather Ranger District of Pisgah National Forest, is gearing up for spring with the opening of the Linville Information Cabin, a Spring Celebration with ranger-led hikes, and the beginning of Wilderness permit requirements. The Linville Gorge Information Cabin, located at the north end of Old Hwy 105, provides visitors with area information as well as maps and merchandise for sale. The Information Cabin opens today, April 29th, for the season. The cabin will be open on Friday, Saturday, and Sunday from 10am – 4pm through October. This year marks the first year of an exciting partnership with the Southern Appalachian Wilderness Stewards (SAWS) for operation of the Information Cabin. SAWS information specialists will be staffing the cabin and are able to provide first-hand knowledge of area trails, camping recommendations, and Wilderness principles. To celebrate the spring season and provide information to the public, the US Forest Service and SAWS are hosting the Linville Gorge Spring Celebration on May 7th from 10am to 2pm at the Information Cabin. The Celebration will include ranger-led talks on Wilderness skills and natural history of the Gorge, as well as information from area groups. 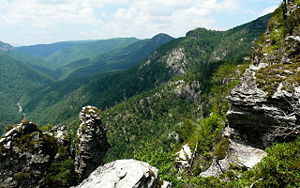 In order to maintain solitude in the Wilderness, the Forest Service limits the number of people camping in the Linville Gorge. Permits for camping in the Wilderness are required on weekends and holidays May through October. Visitors can reserve permits for the following month by contacting the Grandfather Ranger District Office. For example, permits for June can be reserved starting May 1st. A limited number of additional permits will be available on a first-come-first-serve basis at the Information Cabin each Friday starting at 10am. Graffiti—marking, scratching, chalking, and carving on rocks—is unsightly and illegal. It damages the rocks and ruins other people's experience in this natural place. Rangers and volunteer groups spend hundreds of hours every year removing graffiti from the park. 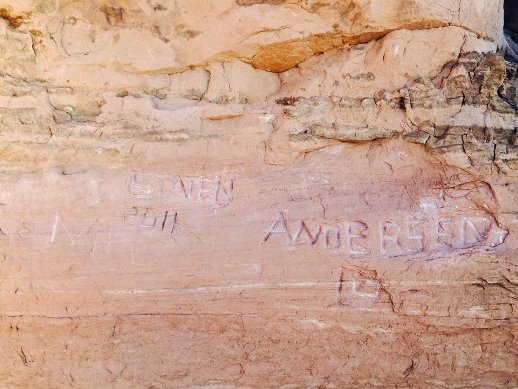 Help us protect your national park: if you discover graffiti in the park, please let us know. There's no time like the present to begin planning for the future. Yesterday I just happened to come across a website that mentioned there will be a total eclipse of the Sun next year. 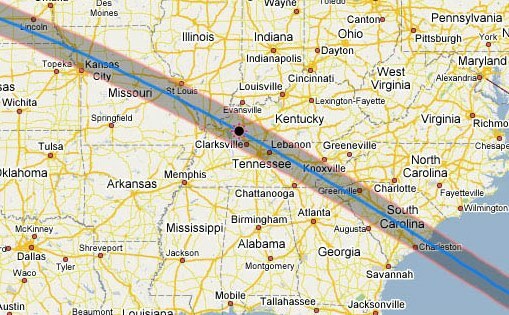 This is significant because it will be the first total solar eclipse visible from the contiguous United States since 1979, and will be the first total eclipse visible from the southeastern United States since March 7, 1970. In case you fell asleep during your high school astronomy class, a solar eclipse occurs when the Moon passes between Earth and the Sun, thus totally (or partially) obscuring the Sun. If you're located within the narrow path of a total solar eclipse, the Moon will appear to be larger than the Sun, thus blocking all direct sunlight and briefly turning the day into night. Next year's lunar/solar event will take place on Monday, August 21, 2017. The path of the total eclipse will pass over the western half of Great Smoky Mountains National Park, with the center passing near Tellico Plains. The longest duration of totality will take place within the Shawnee National Forest, located just south of Carbondale, Illinois, and will last for 2 minutes and 41.6 seconds. The greatest extent will occur between Hopkinsville and Princeton, Kentucky. Viewers must be within the central path to see the total phase of the eclipse, though you'll still be able to see a partial eclipse hundreds of miles away (as seen in the nearby NASA GIF map). For much more information, please visit the NASA website which has an interactive map, as well as tables listing times for important stages of the eclipse. So you want to go on a hiking trip this summer, but you’re thinking that it might not be a good idea due to the young kids in the back seat. It’s likely you’re concerned that your children will be bored by the idea of traipsing through the woods. Although I hear this concern quite a bit, you really don’t have to hang up your boots until the kids go off to college. 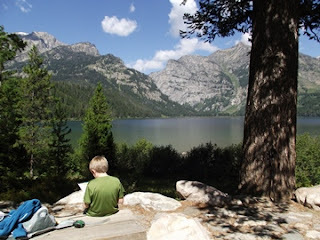 Fortunately there are several things parents can do to make hiking enjoyable for their kids. The key is to keep them interested, motivated and, most importantly, make sure they have fun. Although that might sound easier than it really is, there are several things you can do to accomplish these objectives. For very young kids you’ll have to keep the hike very short. As they get older and begin to build confidence and endurance you’ll be able to gradually increase the distance. Although we as adults enjoy expansive views, this really isn’t important to kids. Children much prefer things that are scaled down to their smaller world view. As a parent you should try to appeal to their sense of discovery and adventure, such as visiting a waterfall, a cave, large boulders, a hollowed-out tree, a gurgling stream, or a lake to possibly where they can skip rocks. In fact, water is usually a great motivator. As you venture further down the trail during your hike try to point things out along the way. Perhaps playing a game similar to that of a scavenger hunt where your children try to find a variety of items such as certain trees, pine cones, wildflowers, boulders, insects, birds’ nests and various wildlife. National parks like Grand Teton, Rocky Mountain, Glacier and the Great Smoky Mountains are all perfect for finding any of these items. A few other important tips to keep children motivated are to let them set the pace, bring lots of snacks, take frequent breaks, be prepared for a variety of weather conditions, and maybe even consider allowing them to bring a friend along. Grand Teton, Rocky Mountain, Glacier and the Great Smoky Mountains all offer many outstanding easy hikes that will appeal to both children and adults alike. A National Park Service report shows that approximately 600,000 visitors to Big South Fork National River & Recreation Area in 2015, spent $19.2 million in communities near the park. That spending supported 263 jobs in the local area and had a cumulative benefit to the local economy. "Big South Fork National River & Recreation Area welcomes visitors from across the country and around the world," said Superintendent Niki Nicholas. "We are delighted to share the story of this place and the experiences it provides. Visiting one of the 13 units of the National Park System in Tennessee is a great way to introduce visitors to this part of the country and all that it offers. National Park Service tourism is a significant driver in the national economy, returning $10 for every $1 invested in the National Park Service, and it's a big factor in our local economy as well. We appreciate the partnership and support of our neighbors and are glad to be able to give back by helping to sustain local communities." The annual peer-reviewed visitor spending analysis was conducted by U.S. Geological Survey economists Catherine Cullinane Thomas and Christopher Huber and National Park Service economist Lynne Koontz. Visitor spending in 2015 supported 295,000 jobs, provided $11.1 billion in labor income, $18.4 billion in value added, and $32.0 billion in economic output to the U.S. economy. The lodging sector provided the highest direct contributions with $5.2 billion in economic output to local gateway economies and 52,000 jobs. The restaurants and bars sector provided the next greatest direct contributions with $3.4 billion in economic output to local gateway economies and 65,000 jobs. 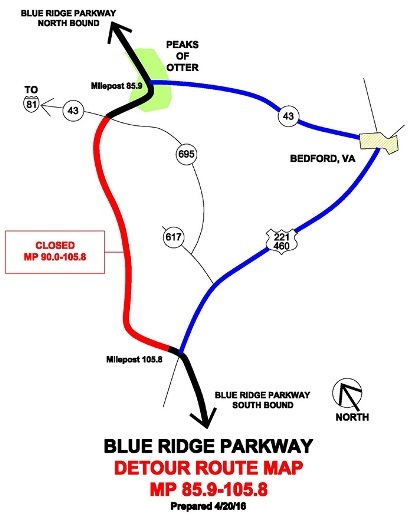 A section of the Blue Ridge Parkway from Milepost 90.0 to Milepost 105.8 will close Monday, April 25, 2016, for approximately five weeks in order to make necessary paving repairs to the road and overlooks in the area. Access to Peaks of Otter from the south will be available via VA-43. Detour signs will be in place to direct travelers around this area. During the first month of the project, both lanes in this section will be closed to all activity (cars, bicycles, and hikers) to ensure the safety of Parkway visitors and staff. After May 25, and as the project continues, the full closure will end and Parkway travelers can expect one lane closures through mid-September. The Blue Ridge Parkway portfolio of paved roads includes bridges, tunnels, parking areas, spur roads, service roads, campground and picnic area roads, and the 469-mile Parkway motor route itself. Across the Parkway, many of these areas exceed recommended life cycles for pavement and are in need of repairs estimated to total over $300 million. Funding for road maintenance on the Parkway comes in large part from the Highway Trust Fund, which is derived from a federal fuel tax. The Blue Ridge Parkway annually identifies projects and competes for these funds to repair and maintain park roads. For more information about road closures, please visit the Parkway's Real-Time Road map. Multiple large wildfires are currently burning along the Tennessee and North Carolina state line, and are impacting communities in Western North Carolina. The Cherokee National Forest and Tennessee Division of Forestry are also working to control the Railroad Grade Fire in the Roan Mountain Area. 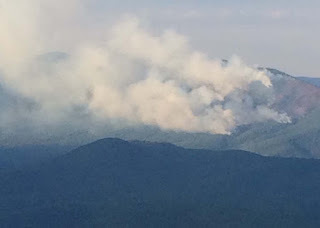 The fire is located in Carter County, TN at White Rocks Mountain approximately 6 miles southeast of Hampton, TN, and 3 miles northwest of Roan Mountain. To protect public safety, a 7.2 mile portion of the Appalachian National Scenic Trail (AT) has been temporarily detoured to Forest Road 293 at Bitter End off Buck Mountain Road. This fire has already burned 1450 acres, and is 60% contained. The U.S. Forest Service is also working to contain a wildfire burning in the Buck Knob area of the Nantahala National Forest, southeast of Franklin, NC. The Buck Knob Fire was reported yesterday afternoon. It is currently estimated at 100 acres. 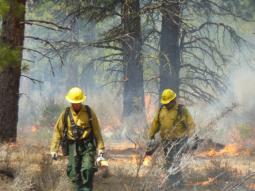 Dry conditions and high winds are impacting firefighting efforts. The fire is burning in Macon County off Old NC 64. A portion of the Appalachian Trail has been closed from Wallace Gap to Winding Stair Gap to protect public safety. Old NC 64 is also closed from Wallace Gap to Poplar Cove Road. Additionally, the Rocky Mount Fire 2016 in Shenandoah National Park has now burned more than 7900 acres, and has also shut-down a portion of the Appalachian Trail. Fire danger remains high across Western North Carolina and Eastern Tennessee. The public is discouraged from outdoor burning until conditions moderate. Awhile back the Great Smoky Mountains Association published a video of the hike to Ramsey Cascades. Dropping roughly 100 feet over the course of multiple tiers, Ramsey Cascades is the tallest waterfall in the Smokies. The popular trail takes hikers though the largest old-growth forest remaining in the Great Smoky Mountains, and passes the 6th tallest tree in the park. For more information on this beautiful hike, please click here. With more than 800 miles of trails meandering throughout the park, hiking is the absolute best way to see the Great Smoky Mountains National Park. In addition to Ramsey Cascades, the park offers many other outstanding hikes. If you do plan to visit the Smokies this year, please note that our hiking website also offers a wide variety of accommodation listings to help with all your vacation planning. Due to a wildfire a portion of the Appalachian National Scenic Trail (AT) has been temporarily closed in the Cherokee National Forest. The USFS has rerouted the trail for 7.2 miles along Forest Road 293 at Bitter End, off Buck Mountain Road north to the first field. There are several water sources available along Forest Road 293, and one up at the field JCT. The U.S. Forest Service and the North Carolina Forest Service are warning the public of high fire danger across North Carolina. Fire danger is high across the state due to lack of rainfall in recent weeks and low humidity. Conditions across North Carolina are forecasted to remain dry for the next couple weeks. April typically marks the height of wildfire season in North Carolina. This year, with limited rainfall throughout March and April, forests are especially receptive to spreading fires. Concern is highest in Western North Carolina where trees have not fully leafed out. Both agencies would like to remind the public to use caution in any outdoor burning. "The public is an important partner in fire prevention," says Riva Duncan, Fire Management Officer for National Forests in North Carolina. "Right now, with fire danger at critical levels, we are urging the public to use common sense when it comes to outdoor burning." 99% of wildfires in North Carolina are human caused, with the greatest number caused by back-yard debris burning. Even when burn-bans are not in effect, conditions may not be advisable for outdoor fires. The public is discouraged from lighting campfires and burning yard waste during periods of low humidity or high winds. Both the U.S. Forest Service and North Carolina Forest Service are currently responding to multiple wildfires across North Carolina. Great Smoky Mountains National Park officials have announced the schedule for the next phase of the Alum Cave Trail restoration project. Over the next several months Trails Forever crews will focus restoration efforts on several targeted locations along the 5-mile trail to improve visitor safety, and to stabilize eroding trail sections. The restoration work will require temporary trail closures throughout the six-month process. Alum Cave Trail and associated parking areas will be closed May 2nd through November 17th in 2016 (excluding federal holidays), on Monday mornings at 7:00 a.m. through Thursday evenings at 5:30 p.m. weekly. Due to the construction process on the narrow trail, a full closure is necessary for the safety of both the crew and visitors. Hikers can still reach Mt. Le Conte, LeConte Lodge, and the Le Conte Shelter by using one of the other five trails to the summit. The LeConte Lodge will remain open during this time. Hikers and backpackers should also note that the Mount LeConte Shelter will be closed Monday thru Thursday from May 2nd thru October 13, 2016 to accommodate a youth crew that will be working on the project. The closure of the Alum Cave Trail this summer provides hikers with the opportunity to explore other routes to Mt. LeConte. The Boulevard, Bull Head, Rainbow Falls, Trillium Gap, and Brushy Mountain trails all lead to Mt. Le Conte (please note that trailhead parking is limited for some of these trails). Day hikers may also want to consider other trails that offer stunning views, such as the Chimney Tops Trail, the Forney Ridge Trail to Andrews Bald, or the Appalachian Trail from Newfound Gap to Charlies Bunion. Trails Forever is a partnership program between Great Smoky Mountains National Park and the Friends of the Smokies. The Friends have donated $500,000 to support the program, in part through the generosity of the Knoxville based Aslan Foundation. The Trails Forever program provides the opportunity for a highly skilled trail crew to focus reconstruction efforts on high use and high priority trails in the park including the recently restored Forney Ridge Trail and Chimney Tops Trail. The program also provides a mechanism for volunteers to work alongside the trail crew on these complex trail projects to assist in making lasting improvements to preserve the trails for future generations. A fire was reported on Saturday, April 16, 2016, within the south district of Shenandoah National Park. The Rocky Mount Fire 2016 is currently estimated at 7935 acres, and is burning entirely within the park boundary in designated wilderness. As of late 4/21, 40% of the perimeter has been contained. No structures are currently threatened by the fire. The cause of the fire is under investigation, but is likely human caused. Skyline Drive is also closed from Swift Run, mile 65, to Loft Mountain, mile 79. The fire is within the park's Fire Ecology Zone, where fire is allowed to occur to achieve natural resource benefits commensurate with the park's responsibility to protect life and property, and keep the fire within the park boundaries. A "Maximum Management Area" has been defined, and holding actions will be taken as necessary and appropriate to keep the fire within that area, and within the park. The Pisgah National Forest is encouraging visitors to Graveyard Fields, Black Balsam, or the Shining Rock Wilderness areas of the Pisgah Ranger District to be on the look-out for black bears. 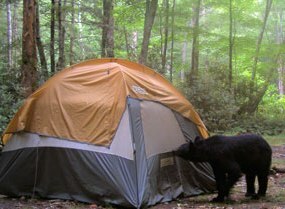 The large number of bear sightings and encounters in the past few years has led to required use of bear-proof canisters in these specific areas (see http://go.usa.gov/czWXR) and a camping closure in Graveyard Fields (see http://go.usa.gov/czXJQ). Backcountry users must use commercially-made canisters constructed of solid, non-pliable material manufactured for the specific purpose of resisting entry by bears. Black bears look for food that campers and trail users bring on their trips. While black bear attacks on people are rare, such attacks have resulted in human fatalities. Access to Linville River Picnic Area will be available from the south at US221. Access to Linville Falls camping, trails, and visitor center at Milepost 316.4 will be available from the north at NC181 near Pineola. Detours signs will be in place to direct travelers around this area. For more information about road closures, please visit the Parkway’s Real-Time Road Map. Although most thru-hikers have already left Springer Mountain, backpacking season is just beginning for almost everyone else. Whether you're a thru-hiker, a section hiker, or a backpacker who only wants to spend a night or two on the Appalachian Trail, you may want to note that National Geographic has recently published a series of Topographic Map Guides for the world's most famous long-distance hiking route. In all, National Geographic has published 13 sectional map guides that cover the entire length of the 2190-mile Appalachian Trail. Each guide is printed in a small booklet format - which includes a series of maps printed on each page. Each page is a detailed topographic map centered on the Appalachian Trail, and includes side trails and surrounding terrain. Along the bottom of each page is an elevation profile that shows the distance between shelters, camping areas and trail access points. The pages at the front of the guide include information on water sources, camping options, resupply locations, town inset maps, key points of interest, history, safety guidelines and other pertinent information about the trail. Just like all Nat Geo Trail Maps, each of the map guides in this series are waterproof, and are printed on rugged, light-weight, tear-resistant paper. When folded, the guide is similar in size to most Nat Geo Trail Maps: 4.25" x 9.25"
The Springer Mountain to Davenport Gap section, the first guide in this series, covers the trail through Great Smoky Mountains National Park. This sectional guide is 48 pages in length, and includes 17 double-page maps. The first 10 maps cover the Appalachian Trail south of the park, while the last 7 cover the route through Great Smoky Mountains National Park. * The elevation profiles at the bottom of each page, as well as the distances between key points along the route, are extremely helpful. * Although I was a little skeptical at first, I believe the booklet format is a very convenient way to keep track of your progress each day, and for planning what's on tap the following day. * The grid showing camping and water availability sites at the front of each guide, and the contact information for key agencies, will certainly make pre-trip planning a lot easier for most people. * Mainly the scale of the maps. At 1:63,360 (or 1 inch = 1 mile), I thought the scale was a little small. Although slightly larger than the overall Nat Geo map for the entire park (1:70,000), I would much prefer the scale that National Geographic uses for the two sectional maps of the Smokies. At 1:40,000 (or 1 inch = 0.6 miles), trail and terrain details are much easier to read on these two maps. In a related critique, I would've also preferred that Nat Geo produce a guide dedicated only to the Smokies, given how popular this section of the trail is to both hikers and backpackers. In addition to thru-hikers, many people only backpack this section of the A.T., or use portions of it to create loop trips. In fact, I would say that if you plan to stay within the boundaries of the Great Smoky Mountains, you may want to consider purchasing the two sectional maps that cover the eastern and western portions of the park. The only downside to this option, of course, is that you won't have elevation profiles for the trail, or any of the other pre-trip planning data. Below is another outstanding video from "The West is Big! Travel Guides". This short video highlights the popular hike to Iceberg Lake, one of the best hikes in Glacier National Park, if not the entire national park system. The hike features stunning alpine scenery, up-close views of the Ptarmigan Wall, wildlife, wildflowers and of course, the alpine lake that typically features floating icebergs. In this video the videographer is forced to temporarily retreat due to a family of grizzly bears on the trail. This is fairly typical, as I have seen at least one bear on this route every time that I've hiked it. Because the trail passes through prime grizzly habitat, most visitors choose to take a ranger-led hike. Hiking in groups is the safest mode of travel in grizzly country. Most human-bear encounters occur with solo hikers who don't make enough noise to warn bears that they're passing through. As a result, the park recommends hiking with at least two other people - groups of four is even better. Although you might balk at the idea of doing a ranger-led hike, I've had nothing but great experiences with the ranger-led hikes in Glacier. For more information on this outstanding hike, please click here. With more than 740 miles of trails meandering throughout the park, hiking is the absolute best way to see Glacier National Park. In addition to the Iceberg Lake Trail, the park offers many other outstanding hikes. If you do plan to visit Glacier this year, please note that our hiking website also offers a wide variety of accommodation listings and other things to do to help with all your vacation planning. Her name is Bronka Sundstrom. 13 years ago she hiked to the summit of 14,410-foot Mt. Rainier - at the age of 77, thus becoming the oldest women to summit the peak - a record she still holds today. Bronka and her husband Aki moved to Tacoma WA in 1949. As a survivor of the Holocaust during World War II, Bronka and her husband would find peace while hiking around Mt. Rainier National Park. By sheer luck or accident, my wife and I had the pleasure of briefly meeting Bronka during a hike in the Paradise Valley of Mt. Rainier in 2013.